Earlier this year, Chance the Rapper said that he was becoming roomies with James Blake and was planning to host lots of collaborative sessions at his new Los Angeles crib. It's not too much of a surprise, then, to learn that the Chicago-bred MC has been working on material with a host of notable guests. In addition to his buddy Blake, Chance told BBC Radio 1Xtra that he's been collaborating with Wyclef Jean, J. Cole, Boys Noize and Jessie Ware. "I'm soaking in their energy," Chance said. "These are seasoned, awesome, eclectic artists who know a lot that I don't know. Just just working with them and getting to see their process and getting to share ideas is making me a lot better." 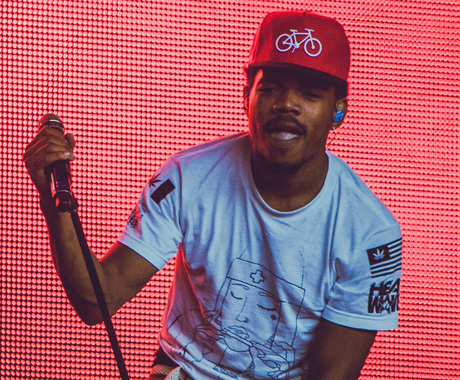 These artists might not appear on Chance's next album, however, since he clarified, "I wouldn't say that too much of it is for me, but that's not what I'm worried about right now. It's not about how you release it — it's just about making sure that it's dope content." In other words, we can likely expect more guest appearance and one-offs as we wait for Chance to follow up last year's outstanding Acid Rap. He explained that, after two years on the road, he's ready to get to work in the studio. Below, listen the BBC interview [via Pitchfork/NME].